Designed to be flown in any one of 4 configurations, this is an incredibly versatile model that should appeal to all ages. In the Extra Long configuration the Tall Boy is over 10 feet tall! The Modular design allows the model to be easily transported as well as the configuration to be easily changed in minutes at the flying field. 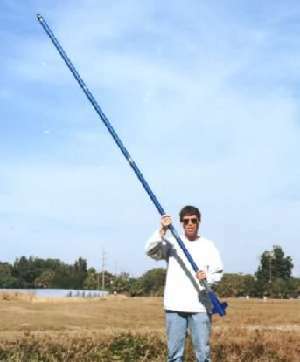 In the Extra Long configuration, the Tall Boy is over 10 feet tall with a diameter of 1.64". This kit can be flown on 24 mm motors (designed primarily for D & E motors), and in Short configurations can also be flown on 18 mm motors with an adapter (not included). The multiple configurations allow this model to be safely flown & recovered on practically any size field - almost "outta sight" flights are easy in the Short configuration and with a E motor the Tall Boy will soar to over 1,500'. The kit features Aerospace Speciality Products' usual top-quality components, outstanding instructions, balsa wood nose cone, laser-cut balsa fins, quick-change engine hook and two parachutes. Adhesives (Wood glue, such as Elmer’s Carpenters Glue, can be used throughout and is recommended for most construction. Thin Cyanoacrylate [“CA”] is recommended for the parachute construction, but not required. Other adhesives [epoxy, CA, etc.] may be used if you are familiar with their use and prefer them. ); wax paper; weights (see Step #6); Hobby Knife with sharp #11 Blade; Ruler; Pencil or Ball Point Pen; Felt Tip Marker; Masking Tape; Sandpapers (Medium - 180 or 220, Fine 320 or 400, & [optionally] Extra-Fine - 500 or 600); Sanding Sealer (or other balsa filler coat); Thinner (appropriate for the type of sanding sealer used); Small Paint Brush (to apply sealer); Spray Paint (such as Testors or Krylon is recommended, do not mix brands/types with testing) - Primer (optional, but recommended), Colors (your choice), Clear (optional). Optional: Material to fill body tube seams and/or any imperfections in wood parts, such as Elmer’s Carpenters Wood Filler, Interior Spackling Paste, etc.